Pricing is subject to change due to possible tariffs. More Sizes First column quantities may vary. The beautiful Victoria Award is an impeccable choice for a new product launch or company merger. The flawless optical crystal cube slants to two blunted points and will be the center of attention at any awards ceremony. This award can be personalized with artwork and a message of your choice. Let me know your thoughts. Dimension: 6-1/4" x 4" x 4"
Click here for general information on all of our products. +What is Included in the Price? Colorfill You can add one or more colors to your deep etch imprint. Each color is an additional cost. 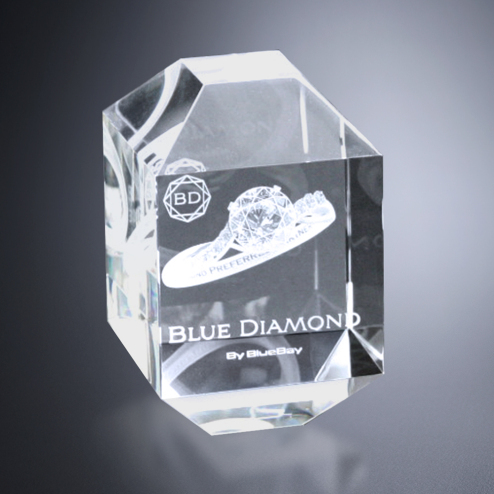 Gift Box: 6.00" x 8.00" x 6.00"
Using our state-of-the-art technology, an image can be recreated inside crystal. A high-laser makes minute fractures inside the crystal, producing a clear image. For over 25 years, Crystal D's imprint specialty has been deep etch. This is created when the smooth surface of the crystal is sandblasted to create a recess. This recess then becomes a frosty-looking imprint and brings forth a beautiful design. 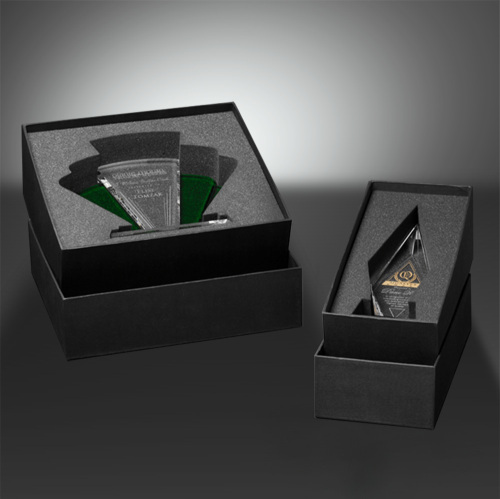 Illumachrome™ is a process where any 4-color image can be adhered to a crystal award or gift, giving it a multi-dimensional and vibrant appearance. Average awards turn into stellar masterpieces when this process is employed. Not seeing the inventory you want? Give us a call at 844-249-6323 or contact us here, and we can make the magic happen.